WHY BROWN LAW FIRM? * Free Initial Consultation * Payment Plans Available * Over 20 Years Experience * Same Day & Next Day Appointments Available * Compassionate & Caring, Not Judgmental PRACTICE AREAS: * Bankruptcy: Chapter 7, and 13 * Estate Planning * Personal Injury WHATE WE DO: Our specialty is bankruptcy filings and we have 15 years of experience backing our clients. We handle cases involving all Chapter filings, document preparation and court representation. Personal injury cases are also a part of our repertoire. Whether it was a car accident, a slip and fall or a work-related injury, it is important to that our clients get the very best representation. We also assist our clients in estate planning to ensure that their families are taken care of upon their passing. Handling trusts, wills and all the other aspects that go into estate planning can be confusing. Though you could handle them yourself, letting us help with the planning can ensure that everyone is taken care of, per the request of the deceased. Your Bankruptcy Attorney - We Don't Judge, We Help! 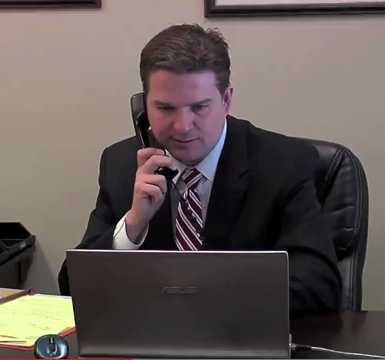 The Tulsa bankruptcy lawyer, Ron Brown of Brown Law Firm, offers FREE case evaluations. Just the very idea of bankruptcy is frightening. Unfortunately, it is sometimes the only option if you ever want to regain control of your finances. There are so many circumstances that could have gotten you to this point, especially with the state of the economy the last two years. At Brown Law Firm, we don't judge, we help. Our goal is to help pull you from the quagmire of debt and on to a stable path towards financial freedom. Bankruptcy is our specialty and we offer you our expert and knowledgeable services in a number of types of bankruptcy, including Chapter 7, which requires you to liquidate your assets to pay off your debts. If you would prefer to reorganize your assets, there are a number of options we can discuss. Reorganization filings involve a plan that allows you to keep your assets and pay your bills through a court-appointed payment schedule. You will be absolved of the remainder of the debt at the end of the plan schedule. These filings include: * Chapter 9 - This form is specific for municipalities. * Chapter 11 - Businesses and individuals with a large amount of assets can qualify for this filing. * Chapter 13 - People with a regular income fair better with this form because they retain their assets while paying off debts based on a court-appointed schedule. * Chapter 12 - This filing is specific to farmers and fishermen. * Chapter 13 - People with a regular income fair better with this form because they retain their assets while paying off debts based on a court-appointed schedule. * Chapter 15 - This form handles filing for international cases. Because bankruptcy already has you feeling overwhelmed, Brown Law Firm offers you a free case evaluation. We will sit down with you, go over your financial documents and determine if filing is even the right option. Once we decide together on a plan of action, we will start the process of filling out the forms and filing the necessary documents. You will also be protected from the harassment of creditors once you hire Brown Law Firm and start the process. Bankruptcy puts a stop to this and any communication from the creditors must go through the court or us. Because everyone deserves a second chance at a fresh start, hiring a Tulsa bankruptcy lawyer could be the best choice you ever make. Call us for a FREE case evaluation and start turning things around. Here's what our clients are saying: "Dear Ron, May many blessings come your way, awoke this morning with a new outlook on my future. When I came to you I had no where else to turn. I had been told by another attorney I wasn't eligible to file a Chapter 7. Wondering if you realize how you transform the lives of others. You have created light where there was darkness. Works cant express the relief of not feeling buried alive by the mountain of credit card debt." "It's nice to have someone such as yourself in my corner to help restore my financial situation." "Ron was able to turn an undesirable situation into a process that was virtually painless allowing us as much dignity as possible. Bankruptcy is not an easy situation to go through but somehow Ron made it easier. He was very professional and always available to take my calls, answer my questions, and somehow make me feel better. I would highly recommend Ron Brown." We help clients move forward & break away from financial crisis. We take the time to understand your financial situation and are not judgmental about how you got there. We understand people just need to know there is a light at the end of the tunnel, that there can be a fresh start. We're here to let you know that everything will be all right. We do most of the work. Other attorneys will give you a "homework" packet to fill out and bring back them. Instead, we fill out the schedules together, and pull all of your creditors from all three credit bureaus. This way, every creditor who is reporting will be notified of the bankruptcy and will be required to cease all collection activities. Even if you forgot one! We return phone calls and answer emails. This may not seem like a big deal, but if you've used an attorney in the past, you probably know what we're talking about. We have the experience to handle your bankruptcy case competently. The Brown Law Firm PC has filed more bankruptcies in the last 2 years than any other law firm in Oklahoma. I am Ron Brown, owner of the Brown Law Firm. Oklahoma is in my blood and that's why I decided to settle my family in Tulsa and serve the people of this great State. I live in Tulsa with my wife and three kids who share my passion for Oklahoma. Born and raised in Oklahoma, I received my Bachelor of Arts from Oral Roberts University right here in Tulsa. From there, I received my Juris Doctorate from University of Oklahoma. I am certified by the Oklahoma State Bar Association and the Federal District Courts. Because I am so passionate about bankruptcy aid, I am also a member of the National Association of Consumer Bankruptcy Attorneys (NACBA). As a member of the NACBA, I fight all the way to the halls of Congress as an advocate of consumer debtors. Started in 1992, this association has grown to a membership of more than 4,000 attorneys in all 50 states. Our job is to be the voice of our consumer bankruptcy clients and we are officially recognized by the Federal Judicial Branch and Congress.